Looking for the perfect solar oven? 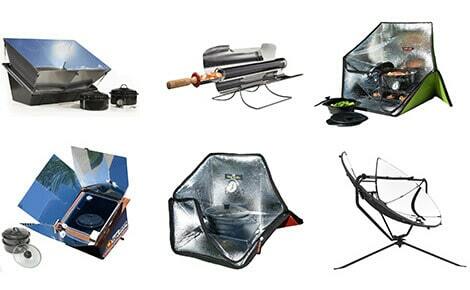 We review 5 of the top solar ovens on the market right now. See how they compare, and find out which one we recommend and why. Solar cooking has a long history and was first documented by Swiss physicist Horace-Bénédict de Saussure. He built the first solar oven way back in 1767. However, it hasn't always been a feasible method of cooking due to the lack of, or the cost of the constituent materials. But, now that technology has caught up with the theory, solar cooking is actually a very effective and accessible method of cooking. The one thing you do need however, that isn't guaranteed for us all, is a steady supply of sunlight. 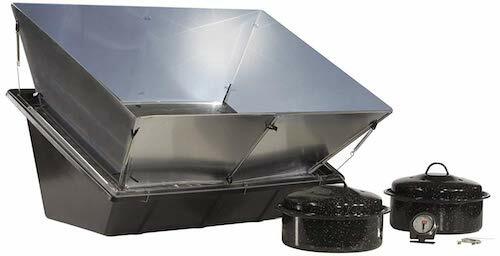 In this post we help you find the best solar cooker for your home with our solar oven reviews. We've chosen the top 5 solar ovens available right now, so you don't have to look any further. We also look at the pros and cons of using solar ovens, how they work, and propose the key things you should look for when buying one. So, how does a solar oven work? Why cook using the sun? These are our picks of the best solar ovens on the market right now. We've grouped them together in a table that can be ordered in each category. See what matters to you and sort it accordingly. Click the image to find out the latest price on Amazon. Following the table there are more detailed sun oven reviews for each model. ​The Solavore Sport Solar Oven reviews comes very well on sites like Amazon, and offers the perfect gateway into the world of solar cooking. It is made in USA, and comes with a high performance, removable reflector. The casing is made of BPA free, recycled plastic that is strong and durable. Despite being sturdily built, the oven weighs just 9 lbs. which makes it easily moved from site to site. The base is just one piece, made under 1000 tons of pressure, and reinforced with glass fiber. It's strong, great at holding heat, and lightweight too. This portable oven is large enough to hold two 10" cooking pots at once. These pots come included, and are specially designed to be used for solar cooking. The oven's lid also helps the cooking process by creating an air space that works as insulation. It let's light in, but traps the heat, much like the way the world is warmed by greenhouse gases trapped in Earth's atmosphere. Closed-cell foam insulation also helps to retain heat around the pan. Importantly, the foam won't absorb any moisture which would reduce the oven's effectiveness. The Solavore Sport also comes with optional reflectors. These are to be used when weather conditions are less than perfect. They will focus the few rays of sunlight hid behind clouds into the oven. This makes this outdoor cooker usable even when it's not a perfect summer's day. It will typically cook at temperatures between 210º – 260º F, but might even exceed 300º F in the perfect setting. The build looks basic, but it has been expertly designed by a team of specialists. The oven is made to cook at a 30 degree angle for overhead summer sun. In winter, when the sun is lower, the oven can be placed on its side to increase the angle to 60 degrees. This means it is always capturing as much sunlight as possible, regardless of the time of year. Bottom Line: The Solavore Sport solar oven is hard to fault. Lightweight and portable enough for life on the move, but also big enough to feed the family. It's a quality oven that comes with everything you need to start cooking outdoors. The new improved All American Sun Oven is 20% larger and boosts cooking temperatures by up to 15% compared to its predecessor. It can reach temperatures of up to 400 degrees Fahrenheit, which makes it versatile enough to cook pretty much anything. Bread, meat, cakes, pasta, pizza.... it can handle anything. It has the option of a fast or slow cook with the option of the conventional oven style, and stove top cooking. It also comes with everything you need to start your outdoor kitchen. There's a roasting rack, dehydrating & baking rack set, 2 easy stack enamelware pots, thermometer, and water pasteurization indicator. An awesome feature of this model is that it takes the guesswork out of aligning a solar oven with the sun. It comes with E-Z sun track indicators that allow you to get the most sunlight with ease. Simply align the dot of light over the hole, and you have the optimum cooking position. This is a really useful feature that means you will always be getting the most energy output. It also comes with a dual purpose leveling rack that can hang inside the oven, or be set on the floor of the oven to increase the cooking space. This gives the Sun Oven some versatility, and makes it great for cooking a variety of different things. This portable oven also with special wind resistant alignment legs. These can be raised or lowered, depending on the position of the sun. This ensures you can always get the optimum amount of sunlight for cooking. These legs are also easily staked into the ground or tied to provide support in high winds. 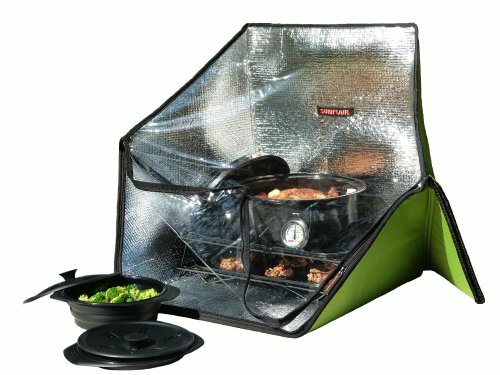 ​Bottom Line: The All American sun oven reviews very well on Amazon, and has some great features that make it easy to use and versatile. It's able to cook a variety of different styles of food. It also comes with everything you need to start cooking straight away. 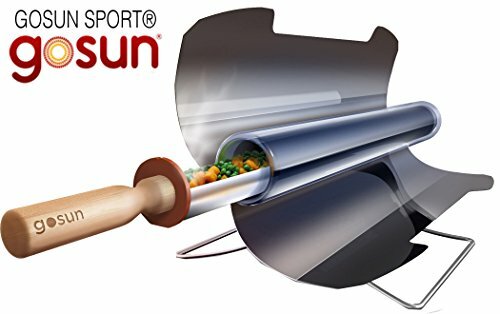 The GoSun Sport solar oven has a unique take on the concept. It encloses the food in a capsule like chamber that allows the food to be heated on all sides. It is such an effective method of heating that GoSun state that is able to reach heats of up to 500 degrees Fahrenheit, and that it is able to cook a meal for two in just a few minutes. Another nice thing about the way that the GoSun Sport cooks food is that you don't need to stir or mix the food to ensure it cooks evenly. Inside the chamber the food is heated from every side and cooked thoroughly from every angle. The enclosed chamber makes sure that all of the flavor and nutrition is contained too. The Capsule is so effective at "gathering" ultraviolet light that it doesn't have to be a bright, sunny day for it to be a cooking day. As long as there are shadows it is able to cook food. The cooking chamber is surrounded by a vacuum tube that provides an amazing level of insulation. The heat is trapped inside while the vacuum tube remains cool to the touch on the outside. While the outside of the capsule will not burn, there is also a wooden handle on the capsule for easily transferring food to a table. The oven weighs just 7.5 lbs. and comes with a case. The whole unit can be folded up easily and placed into the sturdy clam shell carry case. The oven is durable but light enough to be easily transported around. The oven comes with a two year warranty too, which means you can relax on those cross country adventures. Bottom Line: This portable oven will probably cook faster than any of the others. The downside is that it isn't as versatile in what you can cook with it. It's more suited to those on the move, as it is very portable. The Sunflair portable oven is smaller in stature than some of the other models, but it is significantly cheaper too. It costs around half the price of many of the other solar ovens currently available. It features a portable design that means it is lightweight and easily moved around. Despite weighing just 1.2 lbs. it is large enough to cook for up to 8 people. It has two racks that can be arranged to cook in different ways. It comes with two silicon pots that are great for stews, and the racks are perfect for grilling or baking cookies. Besides the pots and racks, it comes with baking trays, a thermometer, and a carry bag. 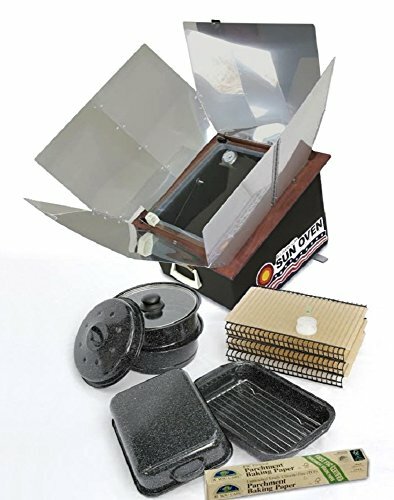 This portable stove features state of the art cell insulation that ensures all available light is captured, and that it is efficiently transferred to heat. This allows the oven to reach temperatures of up to 285º F.
Sunflair offer a 30-day money back guarantee with the oven, and also a 1-year warranty. Bottom Line: Sunflair portable solar ovens are perfect for those on the move, as this weighs practically nothing. Despite being so lightweight has a good cooking capacity. It's also cheap in the world of solar ovens. The SolSource Solar Cooker is different from our other picks in the way that it collects and distributes the heat. The dish effectively gathers the light and focuses it on just a single point. This means it can produce incredibly hot temperatures to cook with. The downside of this is that it is more sensitive to the sun's position in the sky, and you may have to adjust its positioning more regularly, so that it is working at optimal levels. The SolSource cooker is actually capable of producing up to 1000 Watts of power to cook with. This means it is able to grill, boil, or even sauté. With its parabolic style of collecting sunlight, it is able to heat up pretty much instantly too. It can be used from sunrise until sunset each day. SolSource reckon it can reach temperatures of 550°F / 280°C. To be such an effective reflector of light it uses a self healing polymer material. This makes it extremely durable, and reflective too. Despite being so shiny, it is actually very easy to clean. All you need is some soap, water, and a soft cloth. 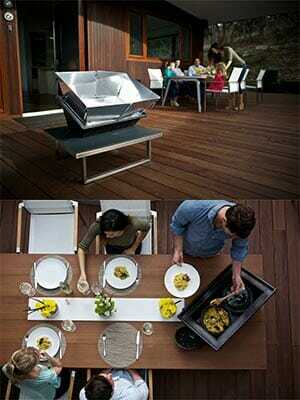 This solar cooker is a 100% recyclable product that is a result of 54 product prototypes. Each iteration in design has refined the build each time. The SolSource Solar Cooker has also been promoted by famous chefs around the world who love the fun it brings to cooking. ​Bottom Line: This is a little more expensive than the others we have featured, but offers something a little different. It reaches really hot temperatures in very quick times. It's definitely one to impress your friends with at the next BBQ. This is an outdoor cooker with a difference! A solar cooker works by "collecting" as much sunlight as possible, before converting this sunlight into heat. Importantly, the heat must be retained for the cooker to be effective at heating food. 1. It must be effective at concentrating sunlight. Using highly reflective materials that are set at particular angles, light can be "gathered" and focused on specific points. Solar ovens are so effective at focusing the sun's energy that some are capable of producing temperatures as hot as 400°C. This is easily hot enough to sear or grill meat. 2. It must be able to change the light energy to heat energy without much loss. The cooking utensils that are used play a very important part in the energy transfer from light to heat. Dark colored surfaces are much more effective at absorbing light energy, and conducting and emitting heat energy. Pots and pans that are dark, thin, shallow, and with lids that seal tightly (to trap the heat) make the most effective containers for cooking with a solar oven. 3. It must retain heat energy well. The cooker should isolate the outside air from the air inside the cooker. This reduces the heat loss. By using a glass lid on a pot or pan a process similar to the greenhouse effect can be produced that allows light energy in and traps heat. This effect is common to those of us that use cars on hot days. When left in the sun the inside becomes extremely hot. This is because the initial light that enters the car has a shorter wavelength. After it is absorbed and reflected back (combined with some water vapor and CO2), it has a longer wavelength that will not pass through the window and remains trapped in the car. Some ovens use a glass window or panel to produce this effect. There are many reasons why using portable solar ovens is preferable over conventional methods. Solar cooking isn't without its flaws either, so it's important that we offer a balanced view. Here are some of the reasons for and against using solar oven. Your fuel is the sun's heat, which of course is free. It's amazing for the environment. Since there is no need for gas, electricity, or coal, there is less demand on resources. Reduce your carbon footprint (read our guide to wind turbines for even more energy saving tips). As there is no combustion, there are no nasty pollutants emitted into the atmosphere like carbon dioxide. Since they have to be used outdoors, they will not cause indoor temperatures to rise like conventional ovens do. This can save energy too. It's a healthier way to cook. No carcinogens or pollutants produced by smoke. No dangerous radio waves produced by microwaves. The moderate cooking temperature doesn't destroy the healthy nutrients in the food. Not relying on the power grid means that it can be used in times of power shortages. It's safe. No fire means no danger. It's very easy to cook with a solar oven. The even temperature of the oven makes burning food a very difficult task. It's versatile. Bake, boil, roast, or grill. It's great fun cooking outdoors! It relies on the weather. No sun, no cooking. It can take a bit longer than using a traditional oven. 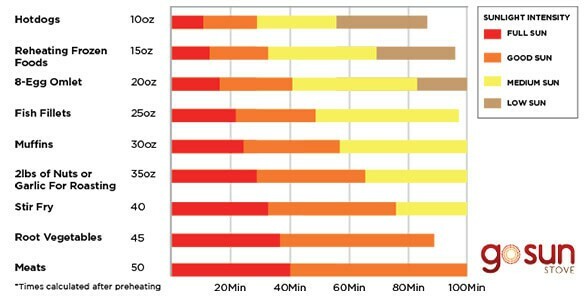 Cooking times will vary, depending on the time of day, and the time of year. Buying one of these for the first time will be a jump into the unknown for most people. Solar cookers come in a range of bewildering styles and sizes. Make sure you get the perfect model for your lifestyle with our buyer's checklist. 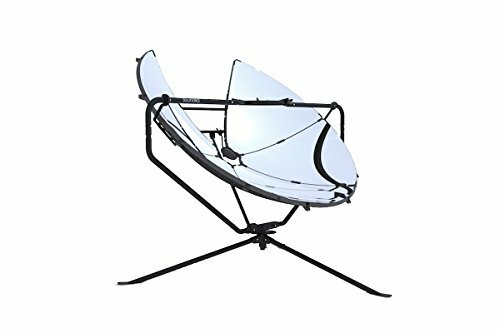 What style of solar cooker is it? Solar cookers generally come in three styles. There are those that heat a box (oven), those that directly heat a pot via panels, and parabolic cookers. The models that use panels to heat a bowl or pot are generally the cheapest and most portable. They won't reach the cooking temperatures of other styles. Those that use an oven style by heating an enclosed box retain heat well and are well suited to things like baking. They are great for meals that can be left alone for a couple of hours to cook. Finally, there are the parabolic solar stoves. They use a dish shape to concentrate heat on a single point. They can reach really hot temperatures, but are more susceptible to the changes in position of the sun. They will need to be turned with the changing sun. Ideally, it should come with a thermometer that enables you to measure how hot your oven is getting. This makes measuring cooking times much easier. It also makes cooking safer. Solar cookers tend to need custom pots and pans that are built to retain as much heat as possible. Does the cooker come with utensils? Also, if you plan on being on the move, does it have a carry bag and is it easily put away? Some ovens are more portable than others. Some state they are portable solar ovens, but in reality they are cumbersome to move anywhere. Check out the stats to see how much it weighs if you plan on traveling with it. Check out our Solsource solar cooker review for an example of a model that's not very portable. Also check its cooking capacity. How many pots will fit at once? How big is the cooking area? Solar ovens aren't cheap so make sure it comes with a warranty to protect your investment. 30-day money back guarantees are becoming more common too, and offer no risk. Our solar ovens reviews make note of the warranty if available. The best solar ovens are well put together and come with decent warranties. That's the end of our guide to the best solar cookers. We'd be happy to help if you have any questions. Just leave a message at the bottom of the page. For more on how you can harness the power of the sun to reduce your energy bills, don't miss our big guide to solar panels.